I think my donation page is now working if you'd like to buy me a beer. 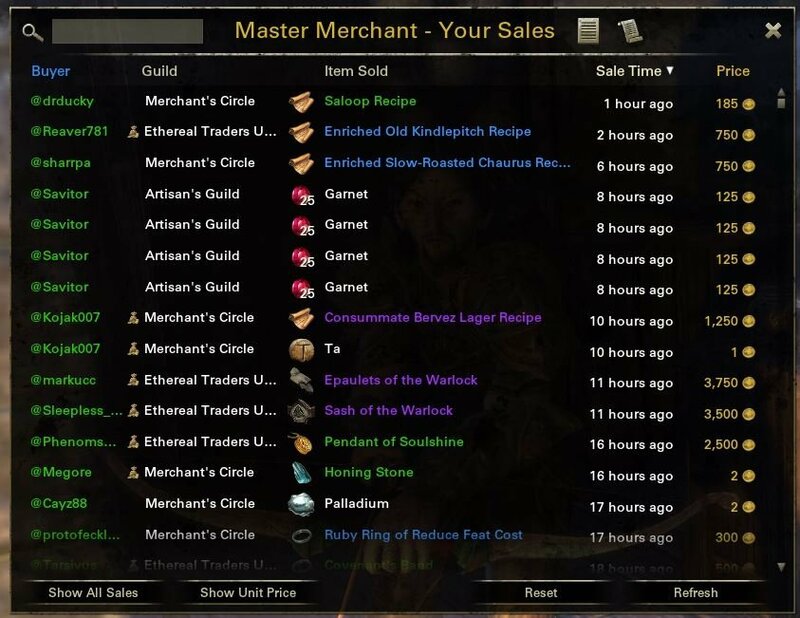 Master Merchant is an upgraded version of Shopkeeper that offers additional features for the Traders and Trading Guilds. 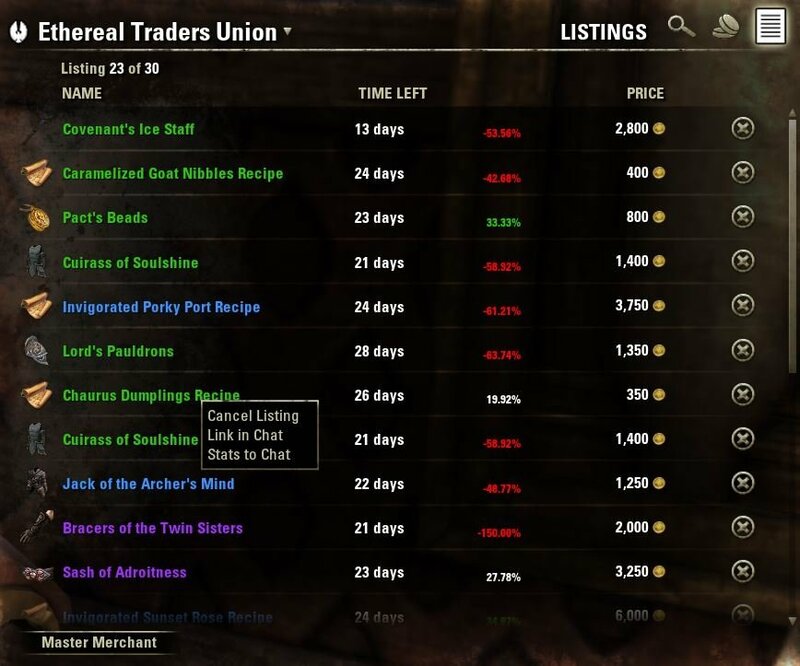 Finally, you can see who your Guild’s top sellers are and what they are selling! Your total Guild Sales and Sales Tax income are at your fingertips – any time you’d like to see them! And that’s just the start. Master Merchant also helps you find GREAT DEALS and provides many other trade-related enhancements! Join the many already using Master Merchant. Try "/mm clean" if you are having data issues. Or "/mm dups" to look for duplicate sales in your data. "/mm missing" will rescan the most recent 10 days worth of data. tttosbt999: "This add-on has totally changed the market for me. What use(d) to take me forever now is a breeze. I actually have time to play the game instead of being consumed by trading. Thanks so much Philgo!" Karraxx: "nice work on this addon, makes selling things a thousand times easier"
Dr._Funkenstein: "Thanks! I don't know how I survived without this!" Many: "What the hell are all these dots, Braille?!?!?" FreakyFreak: "The sales chart you added is so <censor> beautiful I was near tears. Not about how it looks, I could care less, but in design. Seriously brilliant. A very nice surprise to see you satisfy a need without letting obvious limitations stop you. Well done." Focus your pricing to see recent sales in more detail - check the Settings page for details. Sales History Scatter Chart is now available as part of the tooltip. All the dots are a graph of all the sales you've seen, colored to match the guild that made the sale. Price on the left, timeframe on the bottom. Each dot is a unit price of a sale. 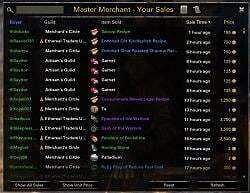 Blacklist - Ask MM to ignore guilds/players when calculating prices and graphing sales. Now with Deal Rating Filtering in Guild Stores with Awesome Guild Store Integration. Install both MM and Awesome Guild Store to get this killer feature!!! Custom Deal Percent/Color Calculators are now available for purchase. Email me in game or at [email protected] for info. 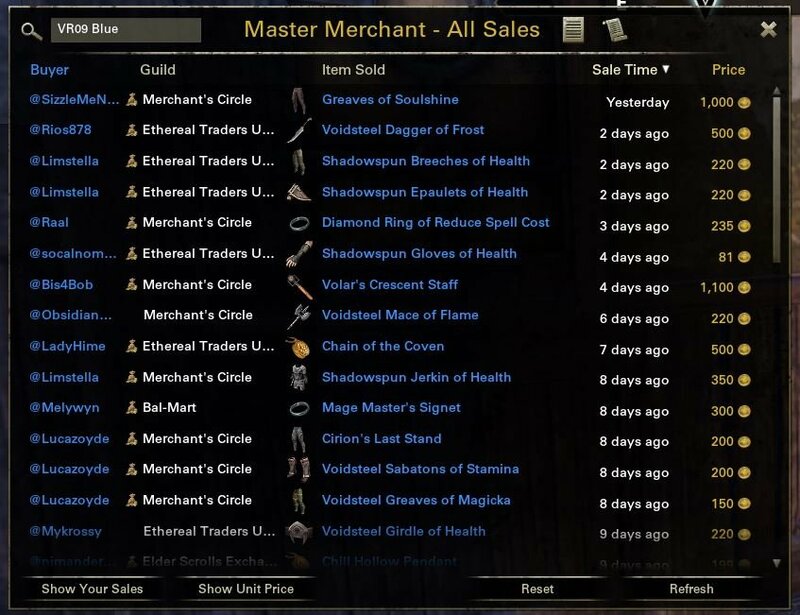 - When you are browsing a Guild Store (including Kiosks), Master Merchant will identify and flag “great deals” and specify how much gold you could potentially make if you buy the items and re-sell it at the average list price in your guild(s). The system uses color coding to rate how good the deal is. White, Green, Blue, Purple Gold. Gold=the BEST deal. Buy it right now! The same flag existing on your listings page so you can easily see if you've offered the deal you want to. 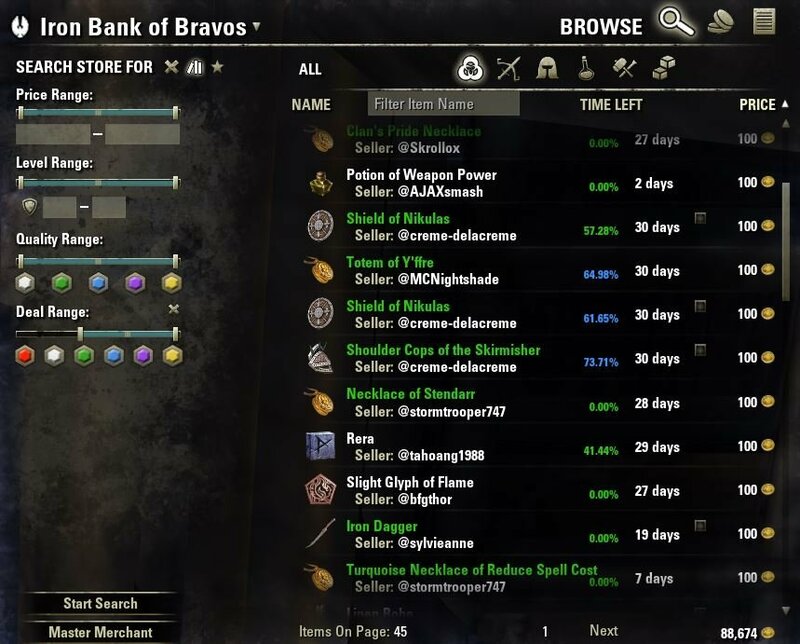 How to use: Just visit any Guild Store (Bank NPC or Kiosks) and you’ll see a new column in the item listings that will highlight Deals and potential profit! - See your Total Guild Sales, Taxes Collected and Number of transactions based on selectable timeframes! 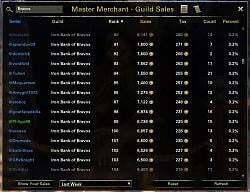 You’ll see total sales info for each of your guilds + all of their members. - Find out who the top sellers and BUYERS are (and aren't). You can generate a ranked report that lists each guild member, sorted by Sales, Tax, number of transactions, or percentage of overall guild sales, based on selectable Timeframes. How to use: Type a guild name into the search box and you’ll see Guild Total plus a ranked list of every member. 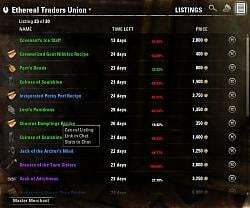 - View all guild Transactions, with toggle to view by Buyer Name or Seller Name. See what the best sellers are making their money on! - Price Check: With “Stats to Chat”, you can right-click on any item posted in chat and Master Merchant will post sales data into your chat box for you to provide a Price Check to someone! How to Use: Right click any item posted in chat and select “Stats to Chat”. The stats will be posted in your chat box, you just need to hit <Enter>. Thanks to Mattmillus for some of the Stats to Chat code. - Automatic Pricing. 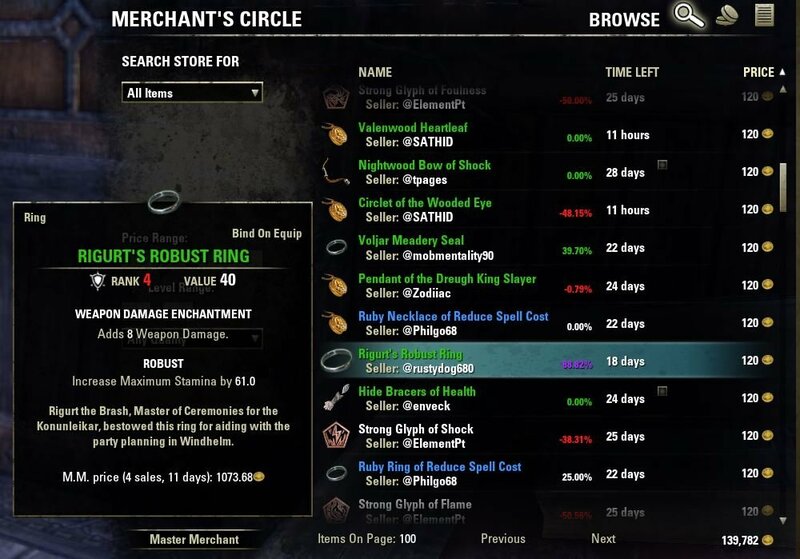 Master Merchant will remember the price you've listed an item at and automatically insert when you place an item up for sale. (If you haven’t listed the item previously, the average sale price will be inserted instead) It also creates a system message for every listing so you can easily review what you've just put up for sale. - Enhanced Filtering: When searching for items on the Item info screen, you can narrow items by quality, level, description and set name. For instance “RR45 Blue” would return all blue items for Level 45. “VR12 Blue Ring” would show you sales history for all VR12 Blue quality rings. How to Use: <Level> <Color> <part of item name> Regular levels=RR, VR Levels=VR. Must add zero for single digit levels. Syntax: VR01, VR12, RR04, RR45. Colors=White, Green, Blue, Purple, Gold. 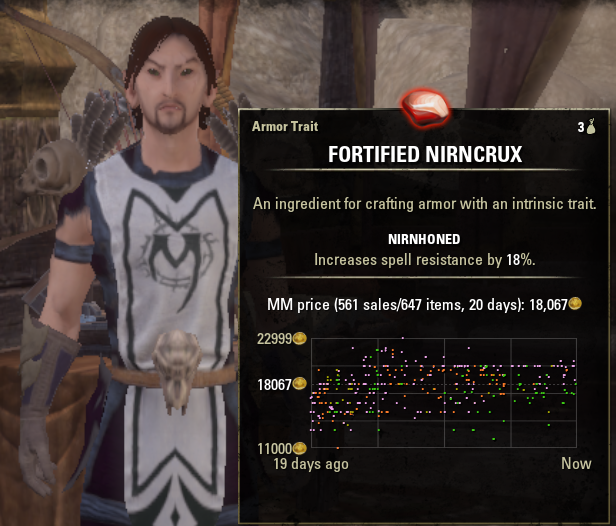 - Multi buff potions now price correctly instead of mixing sales numbers. - Sales Notification Audio: Choose from over 30 sounds for your “Item Sold” notification! How to Use: Open Settings->Addons->Master Merchant and select the sound from the drop down list. While you're there you can see the other configurable option available. - Completely reworked data storage to avoid corruption with large volumes / long histories. For GSA users: After downloading Master Merchant please go to http://www.esoui.com/downloads/info822-GSA.html for IMPORTANT upgrade instructions!! This installs like any other add-on, but it will actually install Master Merchant plus 16 other mule add-ons (MM##Data) to carry the data. Master Merchant depends on these additional add-ons, so they mus be enabled along with Master Merchant. This should hopefully allow you to store just about all the sales history you would like, even in the in busiest of trading guilds. In the Addon directory, you should end up with a MasterMerchant directory and at that same level MM##Data (00-15) directories for the mules. If you have one, you can try renaming your SavedVariables/Shopkeeper.lua file to MasterMerchant.lua to start with your old Shopkeeper data. I’d give this about a 75% chance of working. If you run into problems just delete the Shopkeeper.lua, MasterMerchant.lua and the 16 MM##Data.lua files from the SavedVariables directory to start over. This is based on the original Shopkeeper code. Original by Khaibit, kept alive by dOpiate & Garkin and continued here. Those developers deserve many thanks for their previous work on this code, and it’s my privilege to stand on their shoulders. sirinsidiator For Awesome Guild Store and the help with integration between MM and AGS. Added some protection around Guild Store listing screen to avoid "user:/AddOns/MasterMerchant/MasterMerchant_UI.lua:1454: attempt to index a nil value"
Fixed overrides of TradingHouse functions so you can buy from guild stores again!! Added protection code around custom timeframe selection. Update for Guild Trader change over time change. Added Sort by Guild to MM windows. Added User defined time range to the MM windows and the Guild Roster. 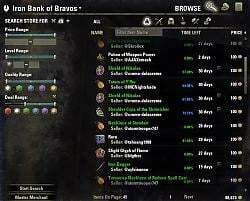 Check MM addon settings under deal and calculation options. Some protection code in DealCalc function to avoid DealCalc.lua:65: operator < is not supported for number < nil type errors. Adjustments/fixes to information displayed on guild roster. Updated LibAddonMenu and LibStub libraries to try to resolve crashing issues. Fix for searching in MM windows. Adjusted method for adding description to saved data hoping to help resolve startup issue some are having. Added item right click option to show item info in the popup tooltip. Added item popup right click option to send item/sales stats to chat. Added "/mm invisible" to reset window locations in case they get positioned off the screen. Try this if your MM windows are not showing up. Added an option to turn on/off the Display Listings chat message. Slight adjustment in anticipation of new AGS fix. Added support for Imperial City/1.7 release. Added Min/Max Item Sale count to better manage fast selling and slow selling items. MM will only purge sales records by date if you have more than the min, and will not keep more than the max number of sales for one item. Added an option to put the MM value of items on your inventory and deconstruction item lists. Added a "/mm clean" option to scan for and remove malformed sales records. Created an Execution Queue library for long running/sequential operations. Adjusted tooltips to show item count for stackable items. Adjusted Auto Advance to Next Page to handle going backward to previous pages. Fixed in 1.6.21a. Removed Outlier transactions from scatter chart also. Added additional duplication checking and added /mm dups command to check for and remove duplicate records if they exist. Russian translation from KirX - let me know if this works and is correct please. I'm not sure the file came through properly. SPEED - Initialization is now 3 times faster and filtering the guild item summary list is at least 15 times faster. Added Auto Next Page Option: If all items are filtered out on a guild store page, auto advance to the next page. Fixed UI error on <ctrl-shift>. Fixed Average cost not getting into price box when listing stackable items. Changed the Guild Item list to have a personal view as well as the guilds wide view. Removed "0" lines from the MM to make them cleaner since you can see members with no sales/purchases on the guild tab now. Adjusted Items and People in the MM windows to have right click menus. Added grid lines to the scatter chart. Looks much cleaner. Scatter Chart dots are now colored to match your guild chat color. Easily see where things are selling!! - Focus: Set days ranges to focus on recent sales, and assign them to Ctrl / Shift keys. - Blacklist: List player(s) and/or guild(s) you would like to have excluded from pricing calculations. Guild Ranking View by Items - See what Items are hot in your guilds!! Added a little protection code in a few places where people were getting odd errors. Added a notice around some lines of code from Millus Roster - Thanks Matthew where ever you are...!! Integration with new Awesome Guild Store. - Thanks sirinsidiator!! Roster display improvements including sorting and better compatibility with other roster addons. Added a Pricing History Graph - enable it in the Settings/Addon Settings/Master Merchant options page. All the dots are a graph of all the sales you've seen. Price on the left, timeframe on the bottom. Each dot is a unit price of a sale. This release is dedicated to @freakyfreak for his awesome support with testing and gold!! Added a settings option for The Guild Roster Info. Removed a debug line I forgot to remove. Significantly improved the initialization after character load. Moved Sales and Scanning related storage to the system level, so all accounts on the machine will share sales history data. Added the pricing tooltips onto a few more windows. Added "/mm missing" feature to scan for sales that may have been missed. Added "/mm clearprices" to remove your listings price history. Made adjustments to the timeframes on the MM guild page. 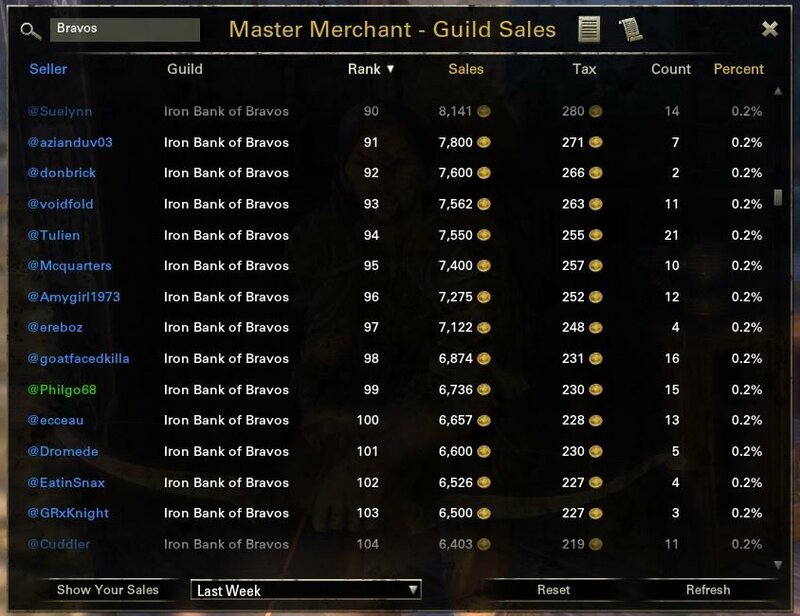 Show Purchases/Sales on the guild tab also. Upgrades to the latest LibMediaProvider library. Moved initialization code back to before character display and reduced init time greatly. Added settings option to move the initialization to after character load for those that have problems logging in. Removed the chat messages during scanning, except for the initial scan or after a complete reset. This build should fix login and rescan issues with large histories. Adjusted initial scan logic to be smoother and not timeout for large initial 10 day scan. Adjust initialization to login faster to avoid timeout, but NOTE: The screen will hang for up to 20 seconds on initial setup. Fixed mini stats window for large number of sales. Icons will update as new sales are seen. Added options to ignore outlier prices and to round prices to the near gold piece. Fix for guild that would not return history correctly, would just scan forever. Another fix for Stat window slider errors. Adjusted special characters in the translation files. Possible fix for Stat window slider errors. **Please note the first time, and only the first time, you run 1.6 your history must be converted to the new item format. The app will automatically /reloadui 16 times and then you will be converted. Added Custom Deal Calculations for @Causa - If you would like one also, e-mail me in game or at [email protected] for details. Added deal tip to your listings page so you can easily check your listings against the market. Added "Stats to Chat" to the right click menu in a number of places. Modified stats slider so "Using all data" is at the right-most limit instead of left-most. 0.9.7a filters out the guild trader hiring events that are now apparently included in purchases. Moved the item quantities in the sales history window to more closely match the default UI presentation. Increased maximum history size since memory usage has been reduced. Increased maximum history size to 15000 - if you use several other memory intensive addons this may cause issues! French localization is now live! Merci bien to jupiter126/Otxics on the EU Server for the translation work! New option in the addon settings to make all your settings account-wide, rather than character-specific. Statistics window resized slightly to accomodate...per-guild filters! The day range slider is also smarter and will hide entirely if you have less than 2 days' worth of your sales to work with. Other minor tweaks and optimizations as we push towards a fully-translated, fully-functional 1.0 release! Added sales stats! Click on the "list" icon at the top of the main window to toggle. Fixed missing localizations on Reset/Refresh buttons. Fixed a minor license issue. Sound options added for alerts. On-screen and chat alert options separated. Shopkeeper button on guild store screen moved down slightly. Fixed alert swarm after resetting listings. Main window now has X to close button and a hotkey binding. Main window now closes when you open the game menu. Eliminated cases where slider could get confused as to number of items in the list. other countries. All rights reserved. don't know where to post a bug. So I try here. Can you help me fix it? @tomtomhotep It sounds like you're trying to turn MM into TTC? I would like the best of both worlds. I believe that the average prices that shoppers actually PAID for an item is much more valuable to me than the average prices that all of the lunkheads out there are TRYING (and failing) to sell the item for. But the more sales data that is aggregated to form that average, the better the average will be. Guld Trader Purchase Icon - does it show guild members too? Had a question from someone else and it made me wonder also. The Guild Trader Icon (gold coin bag) is supposed to designate the buyer bought from the guild trader. But if a Guild Member used the Guild Trader to buy my item using the Trader instead of Guild Store, would they still get the icon or would they revert to a Guild Store only entry? Last edited by Sp00sty : 01/13/17 at 07:07 AM. I absolutely love the addon but find myself always wishing I had more sales data. 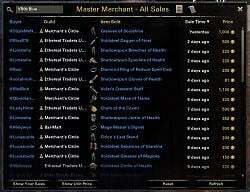 It would be nice to have an addon + app that would handle uploading and merging MM data much like Tamriel Trade Centre does with their data. I own a small business with a web/database server. I'm also pretty good with LUA. I would like to collaborate with you on making Phinix's (and my) dream come true. I am willing to donate server resources (including unlimited database space) for free. I am an EXPERT PHP/MySql programmer, and I can handle writing all of the server-side code that databases the sales data, aggregates it, and sends the aggregate statistics back to the client app. Please share your thoughts. I think every MM user would like this. Truly AMAZING work with the data point graph in the tooltip. So I was wondering, if people from some of the major trade guilds could PM me their MM data files (all in Documents\Elder Scrolls Online\live\SavedVariables\ with the "MMxxData" name format). It should be possible to correlate guild name and timestamp data from user submissions to identify outliers, and flag accounts that submit repeated "bad data" as fraudulent, banning them and removing their data from the merge. Not that many people would go out of their way to manually edit the files just to screw up the data for whatever lame reason. Anyway it would be helpful to get my notepads on some data files, mhmm. When I use this addon I get issues with loging in and out and reloading my UI. I will get Error 301 and my game crashes when I try to re log into another Toon. And Reloading my ui Crashes to login. No issues when I remove the addon. Any fixes or work arounds? Hi, this error happened today. I have deleted the MM files and downloaded again, but the error persists and MM isn't active in game, despite being enabled in the add-on list. Was working fine yesterday. Does anyone have any suggestions? Am happy to edit the LUA if someone can tell me what needs changing. I also tried increasing the LUA memory - went up to 2560, then tried 1024 but didn't help. *Have also put this in the bug list. **After a few hours of messing around I decided to download the files again and wipe out all the SavedVariables files. I lost the history, but MM is working again now. Last edited by jlp300 : 01/08/17 at 01:26 PM. Aaaahhhhh ok i'm so sorry, i've not understand! Thanks anyway! P.s. I've installed that mod too but still no search bar..... I'll ask help on it's page. Also that has been said: The pictures you showed were old. It has been changed. The search bar is on the left side, not on the top anymore. Again: It's another Addon, called Awesome Guildstore. You need to install that via Minion then. 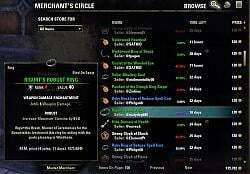 Hi, i stopped playing eso 1 year ago, and there was a search bar. now i come back to game, updated all addons, but in mm i haven't the search box! how to enable it? The search bar in the top left of your MM window is gone? Could you post a picture? This is the screenshot after reinstalling the mod, so no modification applied. Game didn't crash, world didn't end, no one was hurt.